Matt is one of our engineers at Prospress. If he's not coding, providing support or tinkering on something new, he's most likely drinking coffee or trying to find a new dog on Instagram to follow. You can often find Matt at WordCamps, Meetups and WooConfs around the world. Say hello and mention Subscriptions API to get brownie points. 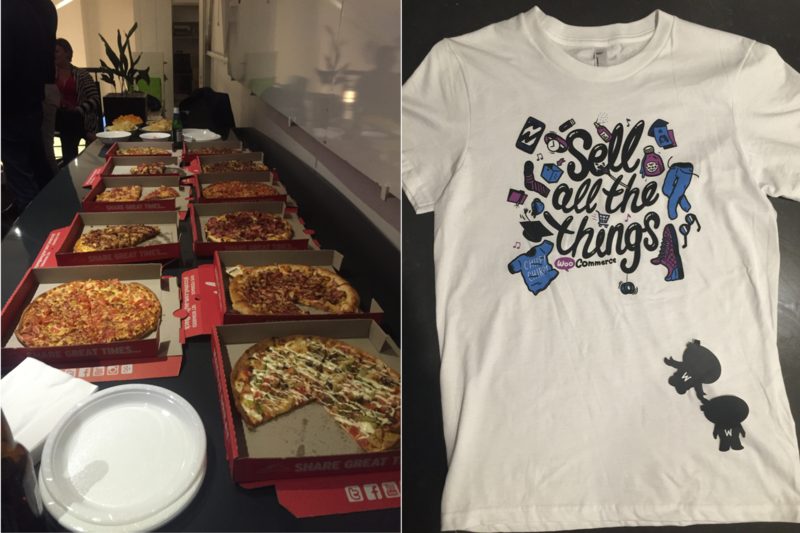 The first WooCommerce meetup in Australia was held on September 24th. I flew down to Melbourne to share the Prospress love and chat all things WooCommerce. Just under 25 locals attended the first meetup which was held in the office of the Emote Digital team. There were many familiar faces amongst the crowd (some of whom I have met previously overseas at #WooConf, and here in Australia at previous WordCamps). The evening started with pizzas and snacks on the table and a bar fridge filled with beers and other drinks. The first talk didn’t kick off until 7PM so there was plenty of time to meet and chat with everyone. I spent a bit of time catching up with most people there and it was great to find out that there was a nice number of WooCommerce store owners, developers and designers all attending, each with varying levels of WooCommerce knowledge (it was beautiful). Jason from Emote Digital hosted the event and provided more than enough beers, pizzas and snacks for the everyone. Emote Digital is an agency that does awesome work online and in the WooCommerce space, building high quality eCommerce sites. A big thanks for taking the initiative to organise and sponsor the first WC Meetup for Australia! WooThemes also sponsored the night by giving everyone the cool new WooCommerce shirts, WooNinja Stickers and WordPress Badges and then to top that off, WooThemes generously gave everyone a 30% coupon to use on their next purchase in the WooThemes store! Bryce Adams, a WooCommerce developer and Automattician, gave a presentation on extending WooCommerce. He started out with sharing his tips on how to start and some general notes on best practices. Then he covered building plugins that depend on WooCommerce and how you can run basic checks for dependencies. He then touched on theming and where to look when first starting out with your first theme, and finished off with hooks and filters and what sort of things to be mindful of when developing your extensions. The take home from his presentation was to look at the Storefront theme as a good example for a WooCommerce compatible theme and to always try to be backwards compatible with at least 1-2 previous versions of WooCommerce when writing extensions. Brendon Wright is the lead digital designer at Emote Digital and he talked about reducing cart abandonment by designing your store to target various different customer archetypes. Brendon started out by assuring us that “around 63% of shopping cart abandonment cases are recoverable”, after which he then dived deep into ways you can design your store to cater for the following five types of customers that will hit your store: product-focused, bargain-hunters, browsers, researchers and one-time shoppers. His talk was filled with great tips on designing just about every aspect of your store, covering all bases like product-archive, description sections, cart layout, checkout and single product pages. Alongside the helpful tips were some statistics to highlight the importance of design such as: 56% of shoppers don’t complete the checkout or return to your store if there are hidden costs involved. Hector Lorenzo is the technical director at Emote Digital who usually finds himself working with front-end stuff. He was the last person to speak, explaining how “overriding templates is bad practice” and giving the reasons why you should try avoid doing this (based on his experiences). He went on to explain the power of actions and filters and gave some good examples of how you can use them rather than overriding WooCommerce Templates. As a result from Hector’s previous work with WooCommerce templates, he has started a project that will help front-end developers find and use the correct WooCommerce hooks in your theme. You can find more info and sign up for updates at WooTemplating. Hector was kind enough to upload his slides, which can be found at WooTemplating too. In just over two hours, the meetup included 3 presentations, time after each talk for questions, and even time at the end for networking and planning for the next WooCommerce Meetup. I had a great time catching up with Bryce from WooThemes, meeting the team at Emote Digital and also meeting all local WooCommerce enthusiasts. 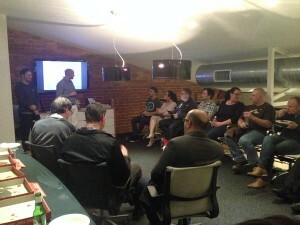 Keep a look out for the next WooCommerce meetup held in Melbourne on the Meetup.com page.